Aside from being almost ridiculously easy to grow, your garlic is going to be fresher and tastier than any imported store bought version- hands down. Most imported garlic comes from China where chemicals are used to whiten the skin (chlorine), reduce sprouting (growth inhibitors and irradiation) and kill pests in storage (pesticides banned in many countries including Canada). It has also been reported that untreated sewage is frequently used as fertilizer. It is important to note that the garlic we eat is the 'bulb' portion of the plant which is in the ground and takes in most toxins in the soil. The best time to plant your garlic is 6-8 weeks before a hard frost. In Coastal BC, where I am from, Autumn is the best time with mid October being ideal. The planting site should have about 3-4 hours of winter sun. The soil should be well drained with a slightly alkaline pH. Raised beds are ideal and soil can be amended with mushroom manure or steer manure (add a month BEFORE planting), compost or Sea Soil. Garlic comes in two varieties: Softneck and Hardneck. Soft neck generally does not produce scapes, is good for braiding and stores longer than Hardneck. (Most store bought garlic is soft neck.) Hardneck has a stiffer stalk with cloves around the base, fewer cloves, edible flower and scapes and grows better in northern gardens. Elephant garlic which is generally huge with bulbs easily 4-5 inches wide, is actually not garlic and is in fact a Leek. 1. Prepare your rows or raised beds and add your soil and amendments. Choose your favourite variety of garlic and let bulbs adjust for 24 hours to outside temperature before planting if they have been stored indoors. Keep the bulb intact and only break into individual cloves just before planting. 2. Space your garlic 6-8" apart with 12" rows. Add a bit of bone meal to the bottom of each hole and plant deep enough so that the tips are about 2" below the soil pointing upwards. Keep in mind to choose the largest healthiest looking cloves as you will be getting a clone of whatever you plant. Save the runts to use in the kitchen! 3. Fertilize in the spring from late March to early May. Don't forget to remove the flower scapes if you have chosen a Hardneck variety to prevent energy from being diverted from the bulb. Use the scapes in a stirfry or pesto instead! 4. Harvest from late July to Early August. Do not water for two weeks before harvesting and gently dig bulbs up when greens are starting to turn 1/2 - 2/3 yellow. Brush off dirt and cure for 7-10 days in a single layer in an area sheltered from sun and rain. Remove roots and cut stems of Hardnecks, clean leaves of Softnecks before braiding. 5. Store your garlic in mesh bags. Keep the largest nicest looking bulbs for next season's planting! Never keep in the refrigerator. Store in a cool, dry, well-ventilated space. What about Planting from Seed? Hardneck garlic will flower and produce tons of tiny seeds. This is an excellent way to increase varieties into your garden (sexual reproduction) because planting from cloves will only produce a clone of what you plant (asexual reproduction). Seeds can take between 2-3 years to produce a decent sized bulb but are well worth it if you have the time and space. Good tips, we love growing garlic of all types. Nice tips. Any fruits or vegetables that we can grow at home are always the best tasting. I love garlic because I know about its many health benefits. And this is a good tip. Will have to try it one day. When we bought our house fifteen years ago, I pulled up all the garlic plants around the front porch. It wasn't until several years later that I found out the fresh garlic plants help repel mosquitos. Never could get any more to grow. 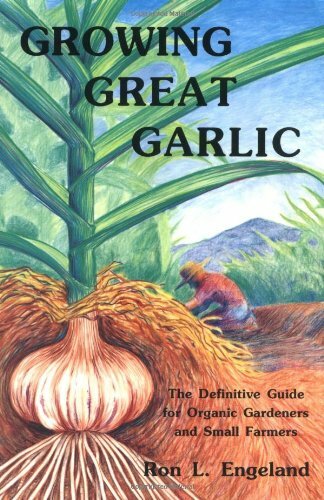 After reading your article I am going to grow garlic plants in the spring.